‘Hina Matsuri is one of the customs that most people in Japan no more observe but that gives an insight to the Japanese thinking and traditions in the past. A hina doll dislay always has the emperor and empress on top with the rest of the court placed on tiers below the royals. The Japanese custom of displaying dolls called ‘Hina Matsuri’ takes place on March 3. The festival dates back to the Edo Period from 1603 to 1867, when the practice included a ceremony during which the sins of the body were shifted to a doll, which is then sent adrift on a river. The ceremony originally came from China. Over the time, the ceremony evolved into an occasion to pray for the health and wellbeing of young girls. Hina, which means dolls, and matsuri, which mans festival, was instituted and the homes of young girls became the setting for doll displays. The original dolls were made from straw and grass, and later evolved into pieces of art made of ceramics and fine cloth. In recent years they are mass-produced and sold in stores. The dolls are traditionally set in elaborate displays that often include peach blossoms, cubed rice cakes, special colored and diamond-shaped rice cakes and white sweet sake. Although no more displayed in most homes, the hina doll displays are set up in many department stores and hotels as promotional props. 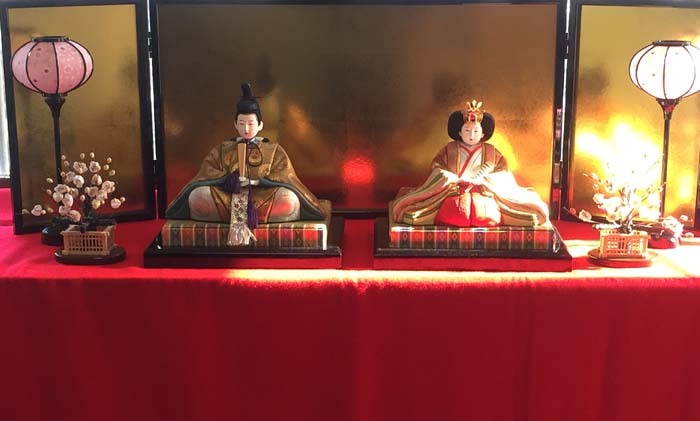 At the core of the displays are the Odairi-sama, a prince, and Ohina-sama, a princess. The typical seven-tiered Hina Doll Set is on a platform covered with a red cloth representing the emperor, empress, attendants and musicians in traditional court dress of the Heian period. The top level of the display holds two dolls, the imperial dolls with the emperor holding a ritual baton, and the empress holding a fan. The dolls are typically aligned in front of a folding gold screen, with accessories consisting of vases placed between the two figures. The Hina Matsuri also features special treats and foods, including amazake, a sweet, non-alcoholic sake drink of fermented rice, with colored arare, bite-size soy flavored crackers, and a soy sauce-based soup that has clams. Clams in food are considered the symbol of a united and peaceful custom because they fit perfectly to each other, but to no other clam.